These gardens were first opened to the public in 1877. The Wrexham Guardian in August of that year described the enterprise of auctioneer and poet R D Roberts (whose bardic name was Mwrog) thus: “Mr Roberts purposes opening these beautiful grounds on the 13th inst. to the public.” The land here was probably once part of the grounds of Ty’n Rhyl, the oldest house in Rhyl. The Botanical Gardens Estate included Belle Vue Gardens, into which the football club moved in 1900. Belle Vue, now known as the Corbett Stadium, is still the home of Rhyl Football Club today. Ownership of the Botanical Gardens changed over the following years. 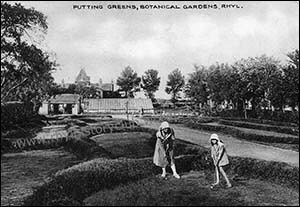 The site fell into neglect for a period, but in the 1920’s the gardens were acquired by Rhyl Urban District Council and were reopened to the public, free of charge, on Whit Monday 1928. In addition to the beautiful gardens, recreational facilities including bowling greens, tennis courts, a miniature golf course and childrens’ swings. A frequent bus service ferried visitors to and from the promenade. The old photo shows the gardens not long after the 1928 reopening. In 2003 Denbighshire County Council planned to demolish the café to make way for a new Register Office and car park. Rhyl South West Central Association was formed and successfully campaigned to save the Gardens for the people of Rhyl. The Association received the 2008 Queen’s Award for Voluntary Service for the gardens’ reinstatement. Since 1937 the Botanical Gardens have adjoined the Coronation Gardens.